One of the first things to understand about polishing marble is that it is the final step in cleaning or restoring a marble floor. 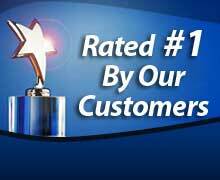 Polishing alone will not remove scratches, surface damage or stains. It will make them shiny and more visible. So any of these problems needs to be resolved before starting too polish. The polishing process starts with preparing the floor by making sure that all dirt and residues from any previous process – cleaning or honing have been completely removed. If the floor is not prepared properly, any remaining dirt or grit can get caught in the polishing pad and leave ugly scratches on the marble. Not what you’re looking for. 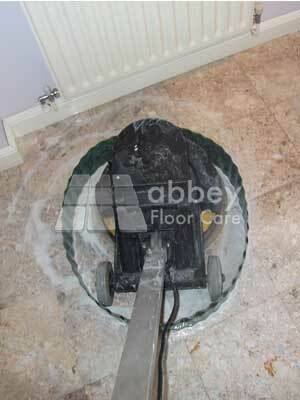 We use a buffing machine with a polishing pad to move the fine slurry over the floor and start the polishing process. The fine abrasives gradually buff out the fine scratches and the chemicals penetrate the surface a few microns (thousand’s of a millimetre) and transform the calcium in the stone into a clear, glass like state, leaving a beautiful glossy finish. We usually put a protective splash-guard around the machine to stop the slurry splashing on the walls. 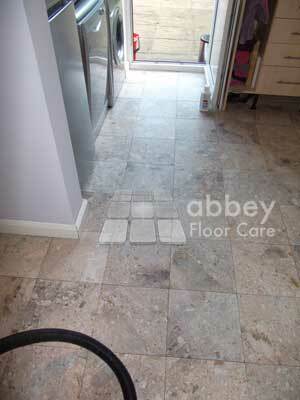 The floor is polished in sections up to 2 square meters. As we polish, we use a squeegee to wipe the slurry and check the gloss level. Once the right level has been reached, the slurry is removed and the area rinsed with a cleaning solution. Then we move on to the next section. Once the whole floor has been polished, we rinse and dry the floor to make sure all of the polishing residue is removed and the floor is perfectly clean. Sometimes a floor needs to have a particular gloss level, to achieve the original gloss or to match other areas of a floor that do not need polishing. 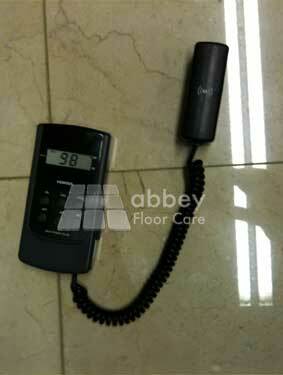 We use an electronic meter to check the level of the gloss and make sure it meets our customer’s need. 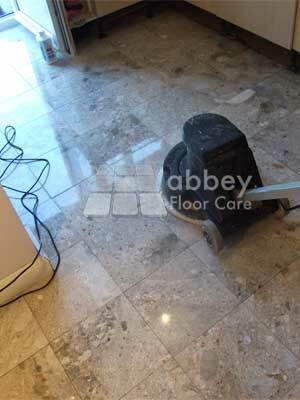 If the meter shows that the gloss level is different, then we re-polish the floor until we get to the right gloss.